- best of all, no matter if you're a buyer or seller, sender of receiver, there're no fees, not even currency exchange fees. - the commercial productivity at both ends of trading happens as typical daily cash payment for products and services. 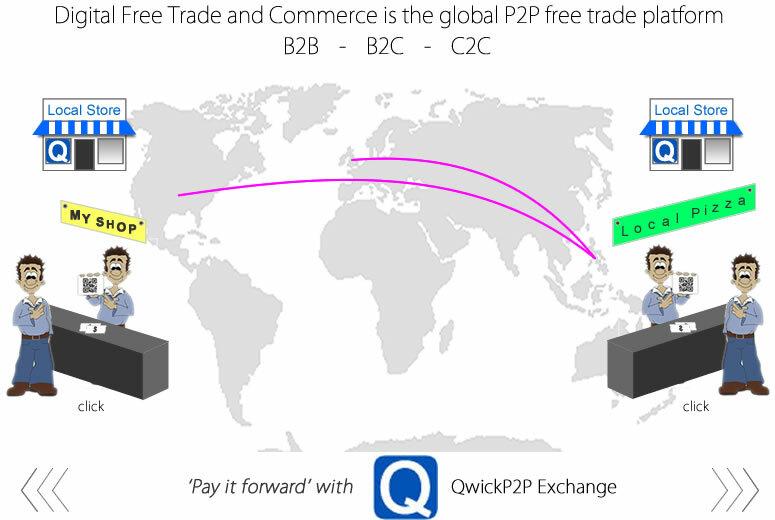 Pay it Forward provides the unique environment that keeps the QwickPay exchanges within the commerce environment. UDC has an intrinsic value tied to productivity of products and services held and sold in commerce around the world. Once this productivity value is validated in UDC it's able to be exchanged without any variation in value within the activity between (B2C), (C2B), (B2B) and (C2C) around the world. Each new UDC buy becomes the settlement time of a purchase previously made between the seller and another buyer, the Pay It Forward action simply continues within the global commerce environment! - it greatly increases turn-over in business cash flows and can significantly reduce the dependency on external credit, it increases the amount of funds moving between local suppliers and communities, relying less on banks and incumbents. - the relevancy of banks and its industry as they exist today will cease to exist as the digital era takes over, the transition will be much faster than it was from the 'horse and buggy to the automobile' with everything from payments to holding value to buying a house will move to the 'Cloud', from where the banking industry, as we know it, will be bypassed! UDC and the equivalent value in product and services listed by the sellers is held at all times by the buyers and sellers in their local communities in the Global Inventory Value in the Cloud. see how Global Cloud Productivity involves the global community! This activity is captured in a unique way with UDI Portfolios that contain locations and the specific activity from around the world, it gives all users the way to gain from real productivity on a global scale! - Queen Bee is an ideal customer acquisition tool that pays for itself with its long-tail! UDC is a neutral P2P trading currency with no transfer fees or foreign exchange fees.